Who am I and why should you read this? Welcome to my educational technology blog! By reading these entries, you’ll get a good understanding of what my life as a technology coach consists of. Here, you’ll find anecdotes of working with technology as people try it out. You’ll also get helpful tips, tricks, and updates on what’s happening (as I see it) in the world of ed. tech. Are you still here? Great! Let’s get going with the fun stuff! This fall, I will be stepping out of my comfort zone and returning to school to obtain my educational specialist degree from Kennesaw State University. The last time I was a student was almost ten years ago. When I got my master’s degree, I had only been out of school for my bachelor’s degree for a year or two. It was very easy to step back in to the role of student. Now that I’ve been out of school for a while, I’m a little nervous about how I’ll step back into that position. There are a few differences in my life this time around. First off, I am now a wife and mother to a very active preschooler. I am also not a classroom teacher at this point in my career. I do have classrooms and teachers who will be willing to allow me to try new strategies/tools with students. However, they are not MY students. I’m excited about obtaining this new degree and learning as much as I can for my career. I’m super geeking out over here! In my job, I get to be exposed to a lot of different technologies. Part of my day to day life is making sure that I stay up-to-date on the trends in educational technology. Last week, I found myself watching a Microsoft event to find out what all of their newest products are. I know you’re probably thinking, “Who would watch something like that?” You’re probably correct. A year ago, I would have asked the same thing. Coming from a district that was at first associated with Apple before choosing the G-Suite route, into a Microsoft district, I had to learn (read: teach myself) the features of Microsoft EDU. Some of the features, I’ll admit, I found myself saying, “Okay, Google can do that, too.” I kept waiting for something really new. Today, I found my new. Microsoft has gotten really good at asking, and listening to, educators what it is that will enrich their teaching. At the same time, more options are being added to allow students the opportunity to create content and express their voice. I’ve been playing around with Office Mix (a program within PowerPoint) and stumbled upon an add-in. Pixton is a comic strip website/app that allows users to create paneled comics, mind maps, timelines, and even graphic novels. As cool as Pixton is, the best features are a premium service. However, while in PowerPoint, users can create their own comic characters and insert them in the slides. Because of the blank slate of a slide, students will be able to show off their understanding of a topic in their own manner. After uncovering this hidden gem, I started virtually shouting from the rooftops as I shared this with my PLN on several of my social networking sites. I really believe that if teachers allow their students the freedom to create using this add-in (among others), they will be pleasantly surprised by what their students come up with. 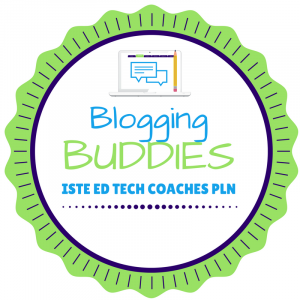 As a way to expand my PLN and force myself to continue to blog, I have decided to join an ISTE Ed Tech Coaches initiative. This initiative will connect me with four other coaches through their blog. I’ll be blogging at least once per month, as will they, and we’ll comment on each other’s writing/topics. My blogging buddies are as follows (you should go check them out, too): Keith Hannah, Lorena Esper, David Dutrow, and Shaina Glass. I’m excited to see where this journey will take me with what I learn and who I’ll meet. Stay tuned for more blog posts coming from me about life as a tech coach! I have been in the educational system as a teacher for the past 13 years. During those years, I can’t tell you how many times a professional development session I went to talked about how one test is not the way to gauge a student’s understanding of a concept. We are taught to give students multiple assessments in various forms. For example, to evaluate a student’s writing ability, we should not only look at their final drafts of essays and research papers, but also at their writing portfolios. We shouldn’t just give them a grammar test. Let them demonstrate what they know by creating an interactive presentation on how grammar and punctuation makes a difference in sentences. It’s been hammered into my psyche so much that I truly believe in this concept. When I moved to another state, my teaching certificate did not transfer. It’s a long and confusing story so I won’t try to explain. Suffice it to say, I had to prove my knowledge as a teacher in this new state in order to obtain a teaching certificate. If you’re thinking that I had to pass a test in order to do so, you would be right. If we are not supposed to limit students to only one test, why would we do that to professional adults? Is my four+ years of education not a good enough indicator of my knowledge? What about my years of experience? Do they not count for anything? Apparently, they do not. Now, my career as an educator in this state hangs on me passing one test. Yes, I should have the knowledge to be able to pass the test. However, my point is that if we are educating students to show what they know in multiple methods, shouldn’t we do the same for professional educators? Yesterday, I spent the day observing a fellow tech coach train teachers on a testing system. This system allows teachers to gather large amounts of data concerning the students with which they work. Right now, the subject of testing is a volatile one. Most teachers hate the idea of giving a series of tests to their students and with good reason. It causes test anxiety, so much is riding on one test, there’s no room for creativity, and educators feel their ability to do their job is questioned when kids do poorly. I agree with every one of those reasons. Now for the unpopular part. In schools with a high number of students who need extra help, testing can offer the data to allow teachers to target those needs. As a classroom teacher, approximately 5% of students in each class period had diagnosed learning disabilities. That doesn’t count the kids who had some difficulties and weren’t receiving services. As I tried to plan lessons, it was extremely difficult to make sure I was meeting each student’s individual needs. That was mostly due to not knowing exactly what those needs were. With a good testing system, teachers can get the right data to ensure they are reaching a student where they are. Throughout yesterday’s training, I heard over and over again, teachers exclaiming that this was the best tool they’d been taught in a long time. Why would teachers be excited about testing their students?? These teachers work with students like I used to: ones who have high needs. They wanted to meet each of those students’ needs and have been spending a large amount of time doing their own data analyses. The testing program was making their lives 10 times easier because it dis-aggregated the data for them. A good teacher wants to reach each of her students where they are. To do so, giving good tests and using the data to meet student needs is the way to go. How are you meeting the needs of your students with data? Why are you using tech in your classroom? I get asked often to help teachers introduce some type of technology to their classes. Whenever I’m asked, my first question is, “Why?” I don’t ask that to be difficult. I ask because the reason for using technology shouldn’t be ambiguous. I’ve heard teachers say that they want to use tech because 1) their administrator expects it of them; 2) they saw a fellow teacher using something that looked kind of cool; 3) they want a class period where they won’t have to be so hands on; 4) someone told them that if they didn’t get on board, they could lose their job, etc. All of these reasons are valid to those teachers. However, I’d like to say that they aren’t the best reasons for wanting to use educational technology in your class. Some educators fear not having the answers when our students ask us questions. Which is why some teachers cling to their county adopted and approved textbook to teach from. With technology, we’re constantly surprised by what we find and what our kids are able to do; we do NOT always have the answers since we’re dealing with an unknown. If you’re reading this, you can probably understand that feeling. So what would I say are good reasons to use technology? If you want your students to become problem solvers, to think outside of the box, to choose what kind of product will showcase what they know, and to push themselves to answer their own questions, these are good reasons to use tech with your classes. Please, don’t say that you don’t have time for this. Our students are living in digital worlds. Technology use in school is not a trend that will go away like New Math. Make time for what’s important and giving your students the up-to-date education they need is important! Before I get into why Sway is a cool tool and how I’ve seen it used, let me give you some back story. For my entire career as a tech coach (a grand four years), I’ve been immersed in everything that is Google. I’m a Google Certified Educator, I’ve promoted Drive to teachers as often as possible, and use it for personal projects because I think it’s so user friendly. Now that I’m working in a district that uses Office 365, I’m getting a hard and fast understanding of everything within the 365 suite of tools. Of those, I am really liking Sway. Sway is, in my opinion, the love child of PowerPoint and a photo slide show. It’s a great digital storytelling way for students to show what they know. There are several things I like about this program. First, as a former middle school teacher who allowed students to create in PowerPoint, I <3 the fact that students don’t have many options as far as transitions/actions. Despite my stern warnings, the students would spend 90% of their work time on changing fonts, slide transitions, colors, effects, etc. Then, they’d run out of time and throw the content on the page. During their formal presentation, their audience would be subjected to an assault on their eyes. In Sway, students have limited options to change the formatting of the presentation. Second, back to those middle school presentations. Besides the assault to the senses, the worst part of being in the audience was listening to the students read. the. entire. slide. Because the format is different, students have to learn brevity and summarization. This is such a great skill that even many adults have difficulty with. Finally, unlike static programs that live on a student’s device, Sway lives in the Cloud. This means that multiple students can access the presentation at the same time and collaborate together in real time! Hopefully, being able to work at the same time will discourage one student from doing all of the work while the other students sit and stare or disrupt others. I’m constantly amazed at the new things I see in educational technology. Just today, I watched a roomful of sixth grade students work collaboratively in Sway. Their goals was to create a presentation convincing investors to financially support their inventions, Shark Tank style. Every student was engaged in what they were doing! When I asked students to explain their project, they didn’t just talk to me; they showed me their presentation in Sway! In what ways can you see this tool being used? So, let me be honest with you. I am not a fan of Kahoot! There, I said it. I know, I know. This is not really a popular opinion. I believe Kahoot has it’s place, just like every other technology tool out there. My problem with Kahoot is that students are more interested in how FAST they can answer the questions instead of how CORRECT they answer the questions. If student excitement is your goal, then Kahoot is great for that. But what if you’re interested in both student engagement AND adequately reviewing content? Let me introduce you to Quizizz. The site’s concept is the same: answer the given question before time runs out. However, there are a few differences. First, questions and answers are all on the student device. The teacher does not have to display anything. Second, even though students are still competing against their classmates, the leaderboard can be turned off. That way, the students won’t be reminded with each question where they are in relation to each other. Third, if you are running the iOS app, the questions and answers can be read to the student. This ONLY works on the app; the questions cannot be read through the site. With students, I’ve used both programs during the same class time. The excitement and engagement was present for both sites. However, the students performed better when using Quizizz. During our reflection time, students shared with me that they felt pressured to answer as quickly as possible in Kahoot, even though they might get the wrong answer. Obviously, every group of students is different and will perform differently. Which brings me back to my one of my original statements: there is a place for every technology tool. You have to decide which tool your situation calls for.